Not for everyone but a good price for a wire free system. Ay um ba da- ay um ba da-da-da-da wadladie day, ONE! Although it is a good price for the base kit, be careful on the extra's you might need. Also consider the features of the alarm. No entry/exit delay, no auto dial built in so it won't actually notify anyone if the alarm is triggered. It's a good price for a very basic alarm, but for not much more, you can get a system with alot more features. B&Q have contact sensors on offer if you need extra. (...)No entry/exit delay, (...)It's a good price for a very basic alarm, … (...)No entry/exit delay, (...)It's a good price for a very basic alarm, but for not much more, you can get a system with alot more features. from movement for more than 2 minutes. Even with a fixed 15 second delay, which isn't alot for most, especially since has to be armed or disarmed via a keypad unless you purchase extra keyfobs, still very basic. It seams that you don´t know much about this alarm, as you said there´s no delay. No one recomends long delays. Of course is a basic set. For 75 pounds delivered what do you expect? I live in a flat, for me it has more sensors than I need! I'm not saying it isn't a good buy, because it is, I'm just trying to make people aware of some of the things which are to be considered. Ahaha the illusion of security! Personally, the solar panel on the siren worries me. Same price at B&Q diy.com/nav…516 if you fancy picking up locally. The point of these has more to do with the psychology of burglars. If you're a burglar and there's a really loud alarm going off, do you think you're going to continue your burgling calmly and assume that the police won't turn up because they never turn up at alarms? It isn't possible to test this, except perhaps statistically over a large number of samples, but in general, having a working alarm will at least act as a deterrent, and even if you do get burgled, if the alarm goes off then it will probably save some of your possessions from being nicked. I have a similar unit, and it has LEDs that flash periodically. I think that's far better than having a dummy box. It is showing as 79.99 now, though, but I am still voting hot. prefer wired systems anyday !!!! Or the person decides to try one of your neighbours who doesn't have an alarm. Switch it on while your asleep at night. Beats the s*** out of a dummy box or no box if someone tries to break into your house while your lovely family are in bed. Oh and I imagine it lowers home insurance a bit. Why don't u spend a little more & get a premium yale wireless system. A very good system & it has a callback facility where it rings u if the alarm goes off. Waste of money for a false sense of security. You're better of getting an adt or similar, so if the siren goes of it actions the Police, otherwise these sirens don't deter anyone in today's day and age. Voted cold. Does anyone have this ? If you get burgled does a siren sound inside the home and outside, or just outside? From experience,something like this is much better than having nowt especially when you have a family and especially at night when you are asleep. It may not deter your hardened career scumbag but it will stop the basic opportunist thief and the majority of break ins are caused by the latter. Understand this.. some people out there will have other reasons for dismissing home security measures however basic or cheap they may be!! Opportunist thieves don't give a damn, a thief is a thief at the end of the day, so why categorize them? They will break in and do what they have to do within minutes. With security you need to go all out or not bother at all. I have an older version using the 433hz technology, has been running for 4+ years. I have the communication one that will dial out if it is set off SA5 £240 paid £69 for it from B&Q. 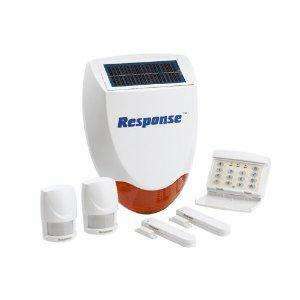 The outdoor solar siren still works, there are two high capacity lead batteries in it. I find 10 seconds for front door is plenty. 20 seconds for back door. There is a jamming alarm on this but if you have something in the house that comes close to the frequency then it will set it off. I've not been burgled since having it and neither has anyone else in my neighbourhood. Makes my wife feel safe when I'm on nights and that is all that matters. so these do nothing but annoy the neighbours when you're out and when they do go off and no one is there to switch it off, the burglar knows its safe to enter and rob you as no one is there? so these do nothing but annoy the neighbours when you're out and when … so these do nothing but annoy the neighbours when you're out and when they do go off and no one is there to switch it off, the burglar knows its safe to enter and rob you as no one is there? They reset same as any other alarm. Only broken alarms go off all day non-stop. Opportunist thieves don't give a damn, a thief is a thief at the end of … Opportunist thieves don't give a damn, a thief is a thief at the end of the day, so why categorize them? They will break in and do what they have to do within minutes. With security you need to go all out or not bother at all. They may still smash and grab but an alarm should limit the time they are in your property thus reducing the chance of them taking a dump on your bed. They may still smash and grab but an alarm should limit the time they are … They may still smash and grab but an alarm should limit the time they are in your property thus reducing the chance of them taking a dump on your bed. This is a fair point and one of the reasons I put a load of sound bombs inside my house, to make the burglar (if any) jump and want to get out of the house. Switch it on while your asleep at night. Beats the s*** out of a dummy … Switch it on while your asleep at night. Beats the s*** out of a dummy box or no box if someone tries to break into your house while your lovely family are in bed. Oh and I imagine it lowers home insurance a bit. I thought insurance companies only offered discounts for a very small number of alarms, specific types, which are actively monitored by call centres (whatever you call them)? Not these off the shelf jobbies? Nope, if I got one of these I wouldn't tell the insurance company. Think of it as £74.99 for piece of mind. Nothing more. Ey ey ba day ba wadladie day, Ay um ba day, Ba day ba wadladie day, Ey ey … Ey ey ba day ba wadladie day, Ay um ba day, Ba day ba wadladie day, Ey ey ba day ba wadladie day, Ay um ba da- ay um ba da-da-da-da wadladie day, ONE! When a house alarm goes of in my street I will check everything is ok, if not I would call the police. So as some posters have pointed out this is better than nothing. Good alarm I have the SL3 one up on this and it runs fine, I am going to buy this as well, it works out cheaper than buying the bits separately; the siren alone is £65. Good alarm very good price. This is a fair point and one of the reasons I put a load of sound bombs … This is a fair point and one of the reasons I put a load of sound bombs inside my house, to make the burglar (if any) jump and want to get out of the house. Internal alarm speaker, makes it over 100db inside the house. Think ill get one from b&q tomorrow.